Daniel & Maurice Calvert (support by Naomi & Liz Calvert), Calverley, West Yorkshire. 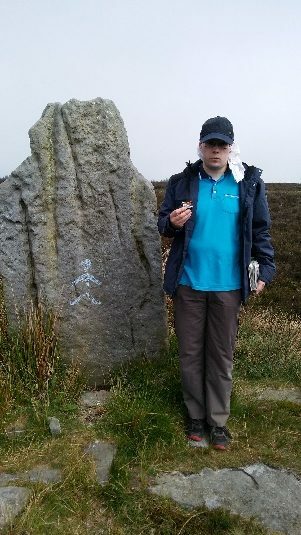 We tried the walk together in 2012 but thunderstorms and lack of fitness meant we only made it from Osmotherley to Eller Beck. 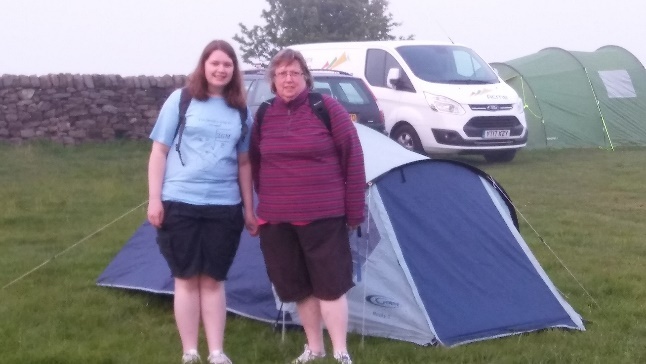 This time we camped at Bent Rigg Farm, Ravenscar and were dropped off at the start stone at Beacon Howes at 0441 in thick mist. We stopped for breakfast (0608 to 0633) just before Lilla Cross and made it to Eller Beck for a short support stop (0802 to 0818), all in thick mist. We rested again at Wheeldale Upper Road (0940 to 0948). By now the hot sun was burning off the mist and we finally saw a distant view westwards from the top of Simon Howe. The heat continued to rise as we reached Blue Man i’ th’ Moss at 1104 and our supported lunch stop on the road below Shunner Howe (1140 to 1235). By then we had realised how very dry the moors were this year, but we still had wet feet from some of the remaining bogs. At the layby on Knott Road we had another short stop (1400 to 1415) before the slog along the road around Rosedale Head in increasingly uncomfortable temperatures. Following Jackson’s Road (1455) was not the best idea with rough ground before attaining the railway track and two hot hours before we reached Bloworth Crossing (1655 to 1705) and our support team again at Clay Bank Top (1810 to 1822). This was so tough, but we had to finish! Setting-off for the final stretch, the mist came down again, blocking any view across the Tees Valley. 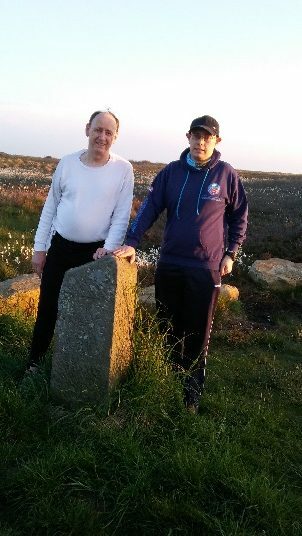 Our support team met us twice more as we battled the final miles at snail’s pace passing Carlton Bank Road at 1952, Huthwaite Green at 2112 and finally dragging ourselves up the last climb to Scarth Nick and the LWW stone at 2226. Successful but exhausted we had completed in 17h 45, 1h 45 behind our planned schedule. It was a long, hard day for supporters, as well! This was Daniel’s first crossing, at his second attempt. Maurice first completed the walk in 1967 aged 10 and this was his 7th crossing: the previous to this was in 1973, 45 years ago. Timings (also in report above). This entry was posted on Wednesday, November 28th, 2018 at 8:10 am	and is filed under Crossing report. You can follow any responses to this entry through the RSS 2.0 feed. Both comments and pings are currently closed.